After the discovery of extensive deposits of placer gold in California's Motherlode in 1848, large numbers of aspiring gold miners arrived in the "Golden State" seeking their fortunes. Within 2 years many of these individuals had fanned out in every direction of the compass looking for gold signs in other parts of the state. In 1851 a group sponsored by John C. Fremont discovered rich placer deposits along Greenhorn Creek near the Kern River (and in the river itself) in what would later become known as the Kern River Rush. These placers were worked extensively until 1865, which should give you an idea of how good the initial gold values were in this region. Forty years ago the US Bureau of Land Management (BLM) wisely set aside several hundred acres of land for recreational mining along the Kern River below the dam at Lake Isabella. This area, the Keyesville Recreational Mining Area, includes a portion of Hogeye Gulch (once a very rich placer) and is quite popular with small-scale and recreational miners from Southern California and the San Joaquin Valley, including the City of Bakersfield (the Keyesville area is just east of Bakersfield in the Sierra foothills). 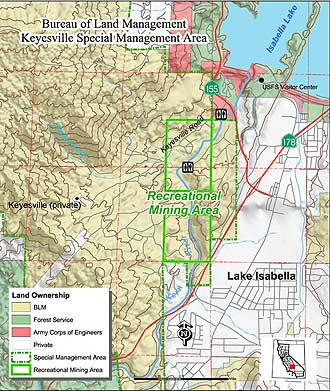 The Keyesville Recreational Mining Area is 2 miles northwest of the small community of Lake Isabella about 1/4 mile below State Route 155. You can access the west side of the gold-bearing Kern River along a paved road (Keyesville Road) or along the east side via an unpaved road that services the Slippery Rock Picnic Area. Appropriate permits are required to operate a suction dredge. Camp fires require permits (you can camp at Keyesville for up to 14 days at a pop, for a 28-day annual total). 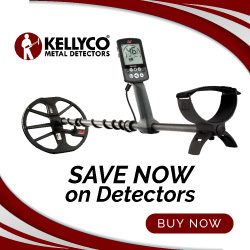 ONLY hand tools can be used for mining and NO motorized equipment is allowed except for suction dredges. This means you cannot use a motorized highbanker or drywasher. I'd check with the Bakersfield BLM Office or local rangers to see if battery-powered drywashers are OK to use. Otherwise, you'll have to use a hand-crank or lanyard "puffer" type drywasher. Suction dredging on Hogeye Gulch is restricted to a 3-inch maximum intake nozzle diameter. Suction dredges have to be at least 100 feet apart and you can't anchor your dredge with cables that cross the Kern River from bank-to-bank. Mining activities involving hydraulicking, highbanking, or "ground" sluicing are strictly prohibited at Keyesville. Sluice boxes, riffle traps, and drywashers cannot have collection surfaces larger than 6 square feet. No mercury or other dangerous chemicals can be used at Keyesville. You can't tear up or otherwise disturb the natural vegetation within the area and if you uncover historical or archaeological artifacts you must stop work and report your find to the Bakersfield BLM Field Office. Over 20 years ago I worked a placer claim near the Keyesville Area and I know a bit about where the gold is, what to look for, and the gold returns you might expect. In Part 2 of this series of posts on the Keyesville Area I'll provide a few tips for those miners interested in the area. Until then, stay safe out there. If you liked this post, you may want to read: "Placer Gold in the California Deserts: a Brief Chronology"
Is Keyesville the only palce to pan or can you go to other spots along the river. I have picked up a few buckets along other spots between Bakersfield and Democrat in the past. Thnaks for the info. I went down by Hart Park today and sucked some sand and gravel into the sluice and found some small stuff. Just trying out my little PVC sucker tube that I made similar to the sand n gold thing I saw online.